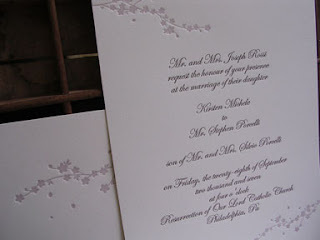 Lavender cherry blossoms, with chocolate brown text, printed on natural white heavy card stock. A very pretty combination of traditional script and modern graphics. Gorgeous, as always! You do amazing work and I watched a video on YouTube for the etsy press materials – fantastic! Loved your book binding technique. May I ask if you use oil or rubber based inks with your polymer plates? You get such great results!